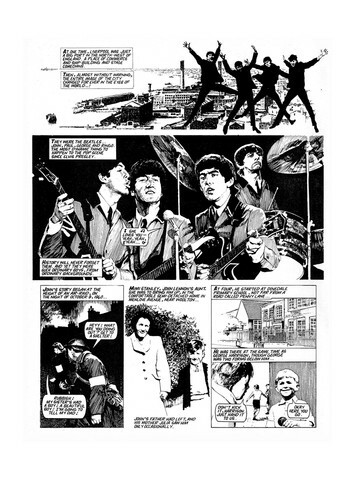 RE-TOLD IN COMICS AND SOUND - THE STORY OF THE FAB FOUR! 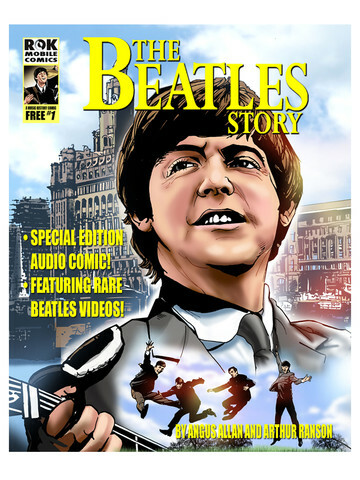 The first issue of an eight-issue audio comic series, collecting, for the first time in its entirety, the classic and highly-acclaimed Beatles bio-strip THE BEATLES STORY - originally created by Angus Allan and Arthur Ranson for the British weekly comic, Look-In. 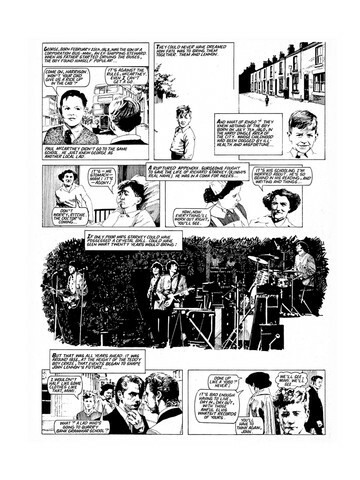 Working with artist Arthur Ranson and the estate of writer Angus Allan, THE BEATLES STORY is complemented by a new audio sound track that helps bring this unique comic biography to life. This special digital edition features Beatles tracks recreated by top tribute band The Fab Beatles and additional audio material from Angie McCartney, Paul McCartney's step mother, offering insider memories of The Beatles. Beautifully realized, THE BEATLES STORY charts the history of the band from their struggle for success in the early 1960s through their entire career until the band's split in 1970. DJ Mike Read has called THE BEATLES STORY "the only worthwhile strip record of the Beatles". The creator-owned comic, first published in British comic Look-In, has only ever been reprinted in an abridged form, both in the UK and in Europe. - Amazing fully-authored soundtrack brings the comic strip story to life! - The sound of the Fab Four recreated by The Fab Beatles! - Audio anecdotes from Angie McCartney about The Beatles rise to fame! - Rare Beatles performance from the ROK Digital archive of "She Loves You" - free! - Looking Back: An article on the the music of 1959, the year some of the boys got together to play!